Choosing a big German luxury sedan is pretty confusing, and if you are an enthusiast who would rather buy a powerful, sharp handling machine, you might be more confused than ever. Thankfully, the German Trio anticipated this, and have built large luxury saloons with lots of power and sharp handling in case someone wanted one car that does it all. These are the performance versions of BMW 7-series, Mercedes-Benz S-class and Audi A8L. Out of these three, the last one will be the focus of our attention today. The 2018 Audi S8 is an absolute blast to drive. It comes with a 4.0-liter twin turbocharged V8 delivering a fascinating 605-hp and 517 lb.-ft. of torque which is mated to a Tiptronic 8-speed auto which is capable of pulling this beast to 60-mph in less than 4 seconds. That’s quicker than a lot of Sports cars out there! Audi’s brilliant Quattro All-wheel-drive system comes standard with this car, along with air suspension and adaptive dampers to improve both ride and handling. While purists and gearheads would be a little skeptical about Audi not using S-Tronic gearbox in here but it’s not even required on this, as the Tip-Tronic is designed to handle the mind-blowing power of this luxury sedan. The steering is spot-on, letting you carve corners easily and giving you every detail about what the tires are up to. In fact, you can sometimes forget how heavy this car is, owing to its power and nimbleness. Still, you will feel the dimensions, especially when making your way through traffic. The Audi S8 is a straight pull from the A8L, and it’s the most noticeable on the exterior. The resemblance is obvious to even the biggest airhead. Even so, there are some clever details that distinguish the performance oriented ‘S’ from the luxury-oriented ‘A’. The S8 looks undeniably sportier, has cleaner contours and lines, luxury looks, and timeless design is something luxury car buyers will love but that keeps the S8 away from looking that something special. You also get massive 21-inch wheels, oval exhaust pipes, all-LED head and tail lamps, a decklid spoiler. The car is also lower by a few millimeters, letting everyone know about the sporty intentions of this car. Be it a car park relaxed or standing a busy street, people cannot and will not ignore this car. Just remember two things; first, it’s an Audi, and second, it’s based on a luxury sedan. Audi engineers simply can’t go wrong with the interiors. The S8 has a typical Audi interior, with minimalist styling details and premium build materials. You also get an MMI display, but sadly no virtual cockpit. The driver’s console only gets an analog speedometer and tachometer with a small MID-screen in between. The Audi’s MMI can be controlled in various ways, like voice commands, steering wheel control inputs, or the touchpad on the center console which is designed to recognize commands on the gesture control dial. Navigation maps are rich and colored and use your cars data connection with a monthly subscription and integrated WI-FI hotspot capability makes this car on-road office. The S8 is equipped with a sunroof, Alcantara headliner, 22-way adjustable front seats, four-zone automatic climate control, power sunshades, Bluetooth connectivity, heated front seats. The more money you spent the more you get but the standard version is well equipped. An optional Sports package, priced at $11,000, provides you increased top speed and adds carbon ceramic brakes but, in reality, you don’t need them as long as you drive on roads. Both the agencies, IIHS & NHTSA haven’t tested it as of now, so no official scores available and due to high price and low volume, this is not going to change anytime soon either. The S8 is built on an all-aluminum space frame chassis, same used on A8, which is light and strong, but you don’t get much safety features aside from a full set of airbags, ABS, traction control. 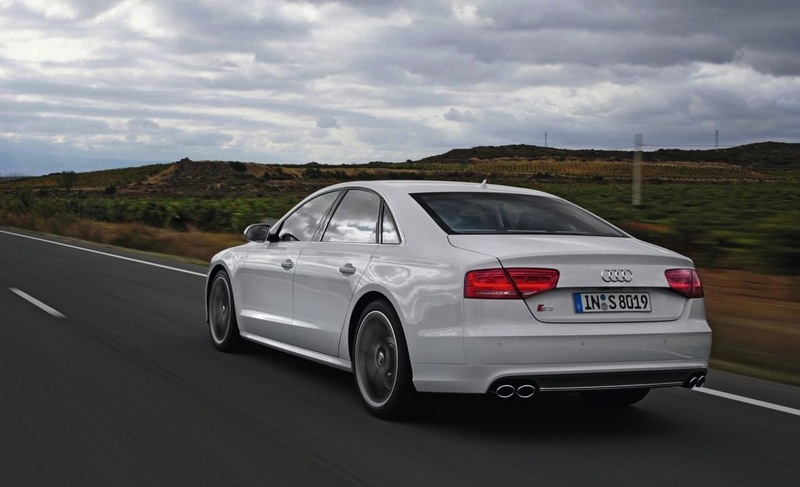 The S8 is faster and the sportier version of the luxurious A8. 2018 Audi S8 MSRP starts at $116,875 at which point it just seems like an extremely good value for money proposition. It has the ability to change itself from a relaxed cruiser to a beast with just a flick of a dial, and the capability to handle every situation. The effortless delivery of power will surely give you loads of driving fun.